With enough power to excel on all sorts of tracks and terrain, combined with an extremely lightweight chassis, the 250 XC has one of the best power-to-weight ratios in it's class. 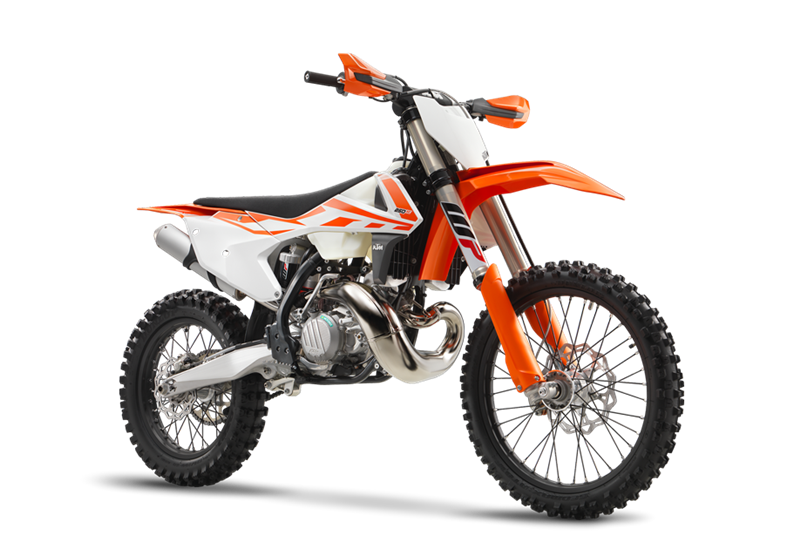 The unrivalled performance of the lightweight 2-stroke engine makes it a true contender against the more complex 4-strokes. CYLINDER The cylinder of the 250 XC is fitted with a sophisticated TVC (Twin Valve Control) power valve, providing adjustable power characteristics. The power character can be changed within a few seconds thanks to two supplied springs for different tracks and rider preference. CLUTCH The KTM DDS (Damped Diaphragm Steel) clutch is fitted with a diaphragm spring, which allows implementation of an internal rubber damping system. Together with a lightweight steel basket and the Brembo hydraulic system the DDS clutch offers maximum reliability, excellent modulation and light lever pull. CARBURETOR The 250 XC is fitted with a proven Mikuni TMX 38 carburetor producing the perfect air-fuel mixture. For extreme temperature or altitude the setting can be tuned with supplied jets and needles according to a setting list in the manual. 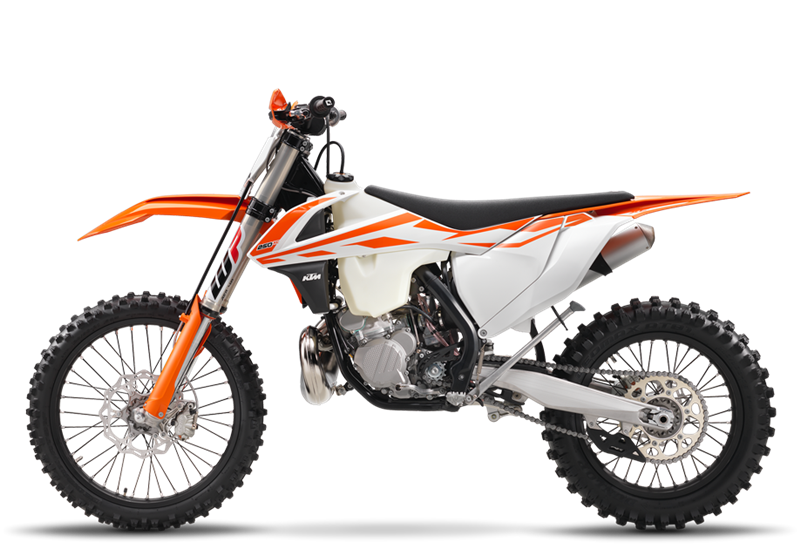 ENGINE The powerful KTM 250 XC engine unites an unbeatable power-to-weight ratio with outstanding performance and extremely easy handling. FRAME The modern frame design of the 250 XC, comprised of lightweight, high strength, chrome-molybdenum steel section tubes, combines maximum longitudinal stiffness with optimum torsional stiffness. LINKAGE/SHOCKABSORBER The linkage system of the 250 XC features a progressive curve with a high initial rate ensuring good stability. The high-end WP 5018 shock absorber guarantees outstanding response and damping characteristics. Compression and rebound damping can be adjusted to the track conditions and the rider's preferences. FORK The XC model range features the 48mm WP AER 48 fork. The setting has been specifically developed for racing cross-country in the US. The forks can be easily adjusted for compression and rebound via the dials on the top of the fork tubes. TRIPLE CLAMPS Top quality, CNC-machined triple clamps have been something of a KTM trademark for years. Ensuring precise handling, they provide proper clamping force for correct flex characteristics, thus improving the action of the forks. For 2017 the upper triple clamp features a newly developed rubber damping system for the handlebar clamp in order to reduce the vibration levels felt through the handlebar. The clamps retain their forward and back adjustability for rider preference. GRAPHICS New modern in-mold graphics highlight the Ready to Race character of the cutting-edge 2017 XC range of bikes. BODYWORK KTM engineers have focused on designing the bodywork ergonomically and functionally in such a way that the whole motorcycle is in perfect harmony with the rider down to the very last detail. The front fender is a perfect example of how molded plastic components can gain maximum stability with a well thought out structure. SEAT The ergonomically perfect seat is equipped with a durable foam core, ensuring both greater comfort and higher stability. AIRBOX At the same time, the design of the airbox guarantees optimum protection of the air filter from dirt plus maximum airflow for the highest performance. 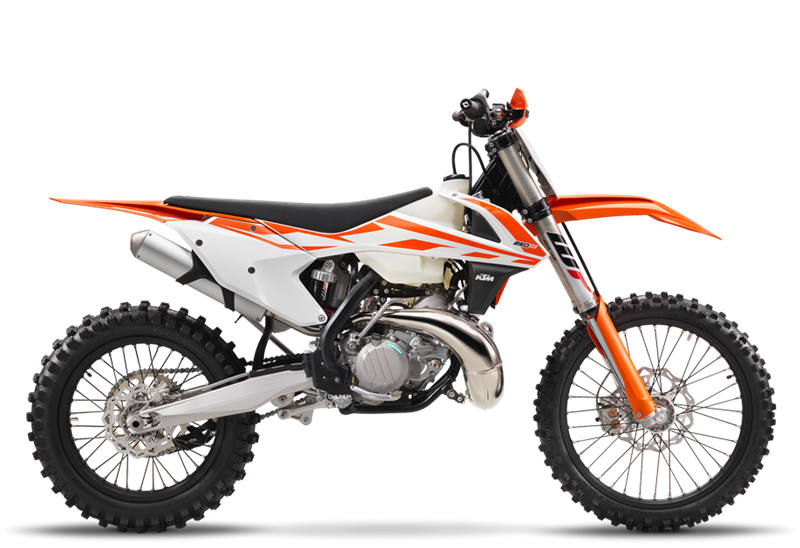 Quick replacement of the Twin Air filter, without tools and in a matter of seconds, has long been an unrivalled KTM standard. HANDLEBAR The 250 XC is equipped with a tapered handlebar made of high-strength aluminum by NEKEN, which is fixed in a new rubber damped handlebar clamp allowing the handlebar to be mounted in two different positions. A new, larger handlebar pad protects the rider in case of a crash.